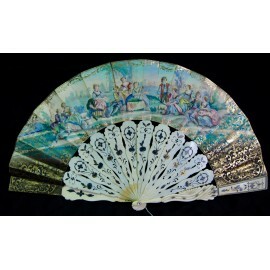 Fan of the late nineteenth century, bone with silver applications, paper engraved and watercolor, romantic scene with figures. Original box, making handmade Spanish Luis Colomina. DIMENSIONS: closed: 27,5 x 3 cm. open: 51 x 27,5 cm.